In 2015, Kathryn Schulz, a writer at The New Yorker, published “The Really Big One,” a meticulous evocation of the massive oceanic earthquake that will someday drown the Pacific Northwest beneath a cataclysmic tsunami. I lived in Seattle then, and the quake was all anyone talked about: at coffee shops, in elevators, on buses. Many articles, even books, had been written about the coming 9.0, but Schulz’s Pulitzer-winning story was the first to grab the slumbering Northwest by the shoulders and shake it awake. Until, that is, the news cycle shifted, people got on with their lives, and earthquakes receded again in society’s consciousness. 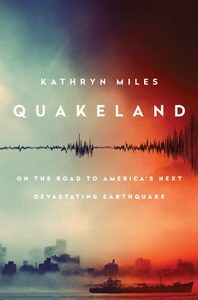 Earthquakes, writes another Kathryn — Kathryn Miles — in her new book, Quakeland, are our most confounding natural disaster. We can watch hurricanes spinning in the Atlantic weeks before they land; we detect the rumbling of volcanoes months pre-eruption. Earthquakes, though, often provide no warning at all. Our grasp of what triggers them is tenuous; we are flying blind when it comes to predicting them. Hence the complacency: Why stress the incomprehensible? “How could we know so little about our planet and the risks it poses to all of us?” Miles asks. 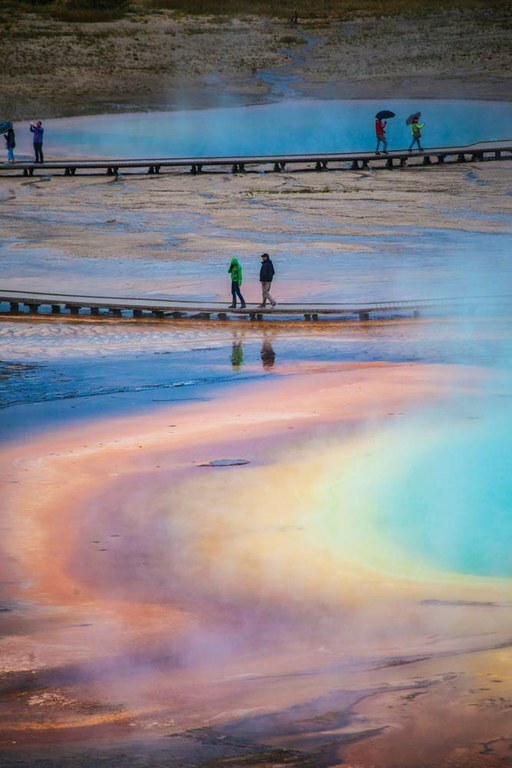 Steam erupts from Grand Prismatic Spring, one of the geological features created by the supervolcano that lies below Yellowstone National Park, Wyoming. Quakeland is Miles’ sprawling, pain-staking attempt to answer that question. The author travels the country, from quake-overdue New York City to Yellowstone National Park, whose slumbering caldera, if we’re lucky, will hold off on annihilating us for a few more millennia. She is primarily concerned with how various sectors — schools, hospitals, oil tank farms — are preparing, or failing to prepare, for Big Ones in their own backyards. No facility goes untoured: Miles descends into an Idaho silver mine, wanders the bowels of the Hoover Dam, and visits the Berkeley seismology lab where researchers are designing quake warning systems for your phone. It’s an epic piece of reporting — as comprehensive as it is discomfiting. We’re not just unready for disaster — we’re exacerbating the risk. Miles is especially concerned about induced seismicity, earthquakes caused by human industry, particularly the injection of fracking wastewater into the ground. The phenomenon’s epicenter is Oklahoma, which went from one of the least seismically active states to the most after a drilling boom. Agencies, beholden to industry, denied the connection until the evidence became irrefutable; other states still skirt the problem. The debate uncannily resembles the conflict over climate change: Fossil fuel interests exploit uncertainty about the magnitude of the problem to justify inaction — never mind the overwhelming scientific consensus about the threat’s reality. Occasionally, Miles’ reporting is so thorough it’s exhausting: I have no doubt that a Southeastern quake would cause headaches for FedEx’s Memphis headquarters, but I’m not sure I needed a chapter to belabor the point. In leaving no seismic stone unturned, though, Quakeland discovers alarming Achilles’ heels in our infrastructure and emergency systems. That at least 30 faults underpin Nevada’s Yucca Mountain does not make me feel more comfortable about someday storing nuclear waste there. Quake preparedness, Miles makes clear, is partly a matter of personal responsibility: Stock your emergency kit with food, water and warm clothes today. Mostly, though, it’s a public policy problem. We must invest in modernizing bridges and developing early warning systems; retrofit our schools and hospitals; advocate for regulations to reduce induced seismicity. Gearing up for inevitable earthquakes won’t be easy, and it won’t be cheap — but we can’t bear the cost of doing nothing. 357 pages, hardcover: $28. Dutton, 2017. Ben Goldfarb is a former HCN intern and frequent contributor who is at work on his first book, Beaverland (Chelsea Green Publishing, 2018).